London, UK -- NATHAN Price is an average five-year-old boy, except for one thing: he has a basic understanding of the core ethics of Buddhism. His parents, Richard and Ruth, introduced him to the principle of "do no harm" when he was three years old. Richard, a sculptor and practising Buddhist, would read him a story about a Chinese poet who goes in search of a lama (a holy man) so he can find out the most important teaching of the Buddha. "The idea of a three-year-old or four-year-old trying to learn that is probably enough at this stage," says Richard, who brought up daughter Joy, seven, in a similar way. "They do a little bit of meditation and they understand the principle of 'do no harm' and vegetarianism as part of that, but at this stage it's just a gentle introduction." The Price family, from near Galston, Ayrshire, appear in the BBC series Child Of Our Time in an episode dealing with children and morality. During filming, psychologists found Nathan demonstrated an advanced sense of empathy. "They set up a kitchen with Nathan and me at a table," says Richard. "We were both given a bowl of pudding and my spoon was doctored to break. My instructions were to act upset about it. Nathan stopped what he was doing, then stopped eating, started to stroke my arm and offered to share his spoon with me." This is all the more remarkable, perhaps, given recent attention to antisocial behaviour, bullying and the perceived decline in values among young people. Yet a basic, fascinating fact about children remains: by far the majority of them grow up to be moral adults, irrespective of religion, culture or specific parenting method (provided it falls within the spectrum of basic good parenting). Larry Nucci is director of the office for studies in moral development and education and professor of education and psychology at the University of Illinois in Chicago. He and his team have carried out research in Brazil, China, Japan and Korea which shows that children around the world develop moral attitudes at around the same age. "Basic issues of harm or fairness are constructed in pretty much the same way by children in any human environment," says Nucci. "Most of the moral language they have up to about age six is about harm. Then they shift to using the language of fairness and their ideas of reciprocity. That typically occurs between six and eight years old, just about everywhere. "In trying to make sense of their social experience, the conclusions they come to are the same everywhere. It isn't something they're born knowing, but it's impossible to grow up as a child and not have the experience of deciding how to distribute things in a way that is fair." This idea, of children navigating morality independently of their parents, goes against the traditional view that knowing right from wrong is something adults "give" to chil-dren. This old theory is thought to have been derived from psychologists who have watched parents say things to their children such as "look, you just hurt your brother" and jump to the conclusion that the child wouldn't otherwise have known that this was a bad thing to do. While it's true that parents do play a role, this is secondary to a child's own reasoning-out of situations. "What adults do is provide an interpretation of what's taking place," says Nucci. "Rather than forming children's morality, the language used by the adults is used by the children as additional information. Children have to invent morality; they have to figure it out." While the Price family are pro-active with ethics, Richard admits the extent of parental influence depends on the child. "In the fullness of time, they'll make their own choice about it," he says. "It's not important for me to bombard them with stuff, just core ethics." 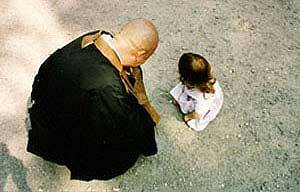 Part of the reason he does try to educate his children in Buddhist ethics is because of the religious bias in school. "We live in a parochial environment and everything at school is Christian. They're supposed to support other world religions, but the truth is it's very heavily biased towards Christianity. If someone's going to indoctrinate your children, you might as well do it yourself," laughs Richard. That said, in recent years there has been a movement to offer secular school education in moral issues, often called "citizenship", "civic education", "character education" or "moral education". This has long been popular in the US, but is becoming more widespread. Marvin Berkowitz is professor of character education at the University of Missouri and was invited to Scotland in 1995 by the Gordon Cook Foundation, which promotes good citizenship and is now based at Aberdeen University, to give talks to schools about values education. "Some families don't socialise their children at all, so schools have a responsibility for doing that," he says. "Opting out is not an option. Every adult who is around children affects their character." In line with Nucci's research, Berkowitz believes the most useful form of character education is that which encourages children to think for themselves. But there are ways in which parents can help, he says: "Kids need to develop the ability to think critically on their own, because there's no way you can prepare them for every moral situation. They have to be able to figure out right and wrong for themselves. "We have to nurture emotions such as empathy, sympathy and guilt. How you do that has to do with the kind of relationship you have with children and the kind of role model you are to them. We want children to develop a self-concept where being a good person is important to their sense of self. That doesn't just come from teaching." This emphasis on children self-educating does not mean morality is innate. Certain moral emotions, such as guilt and injustice, are emotional responses and have an evolutionary role, but it's only when a child starts analysing those knee-jerk reactions that they develop what adults would recognise as morality. Children are also able to differentiate between the messages they receive about right and wrong. For instance, they know that questions such as "should a boy wear a dress?" refer to cultural conventions and not moral absolutes. So far, so good. There is a blip on a child's moral radar, however. It's called adolescence. Two elements are thought to conspire to distort a teenager's concept of right and wrong. First, teenagers prize choice very highly as it enables them to express themselves through clothes, music and friendships. The problem occurs when choice is confused with what they have a right to do in relation to other people. Secondly, they like to test moral theory against reality. They take risks to find out who controls their behaviour: themselves, their parents, or the law. Nucci advises parents to relax and reprimand: "Part of what they're trying to find out is what will happen if they do this. A whole series of studies show that children expect parents to reprimand them for bad behaviour. If the parents don't, the child thinks they're irresponsible parents." Don't worry. Inspite of widespread laments about children's morals, almost all of them develop into moral adults. "If you put a kid in a pro-social family, in a pro-social culture, with parents who understand how to raise a child effectively, the child comes equipped with the tendency to capitalise on that and develop into a good person," says Berkowitz. Interpret their emotional responses and encourage them to think about the consequences of their actions. "Have simple conversations where you talk about the meaning of what happened," says Nucci. "Point out the effects on the other child and ask what they think about it. Children don't have an adult's understanding of the permanence and the devastation of consequences." Reprimand them when they act in a morally wrong way. Religion isn't essential. "Children's understanding of morality is the same whether they're of one religion, another religion or no religion," says Nucci. "But if it's simply indoctrination, it's worse than doing nothing. It interferes with moral development." Understand that teenagers are different. "For adolescents, undesirable behaviour is normal," says Berkowitz. "That doesn't make it okay, but we do need to understand where it's coming from." Consider your own moral development. "Moral reasoning is a tapestry and we continue to change and grow throughout our lives," says Berkowitz. Child Of Our Time, Sunday, January 29, BBC1, 8pm.